We had our pie baking day on Friday, during which we cooked five pies--apple, blueberry, cherry, chocolate raspberry torte and a sweet pinto bean pie-- in addition to two dozen butter tarts (a Canadian treasure, our recipe for which is top secret!). Your nothing-in-the-house pie crust recipe has been a real hit with my relatives over the last few months. It made a lovely addition to my spinach and tomato quiche and the last two pies I made Friday. We took some pictures of the pie enjoyment zone while we ate the chocolate raspberry torte. The first picture is of my grandma looking skeptical before eating the pie and then her smiling afterwards. Thanks for the recipes for the tart and the pinto bean pie! DELICIOUS! 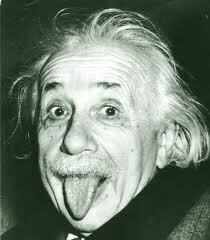 Also, March 14th is Albert Einstein's birthday! The picture I've included is one of my favorites of him; I imagine this is what his PEZ would look like!